In my quest for finding information on the castle that my sister and I located, I found another castle. A moorish castle, a replica of the 12th century Alhambra- the most famous castle in old Granada Spain. The replica was built in 1883 by Franklin Smith, a Bostonian as his home. 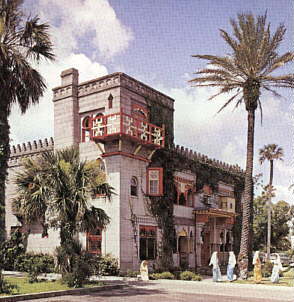 The castle includes treasures such as The 2300 year old Cat Rug, the court of lions, and harem quarters, and a mummy's foot. The windows are different shapes and sizes, due to a legend that spirits may leave through these windows, but would have a difficult time finding their way back in.